Wednesday-Friday, 11am-4pm, Saturday, 10am-5pm and Sunday, 11-2 pm. 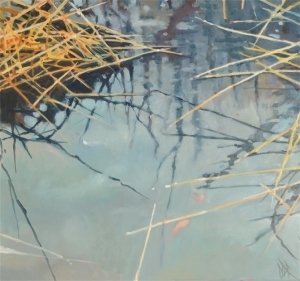 Additional work by Michael Kahn, Catherine Kernan, Vicco von Voss, Rob Glebe and Shelley Robzen. 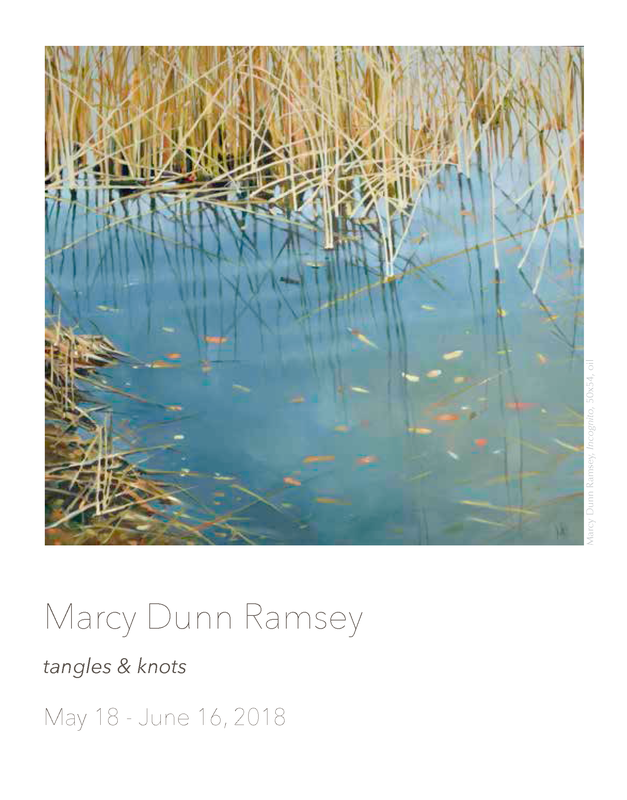 Marcy Dunn Ramsey’s one-person exhibition – Tangles & Knots – opens at the Carla Massoni Gallery on Friday, May 18th and remains on exhibit through June 16th. 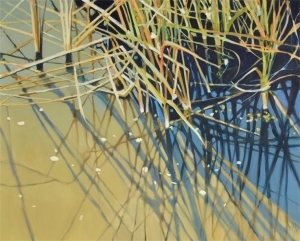 Ramsey has been captivating art lovers and collectors at MassoniArt for over twenty-five years. 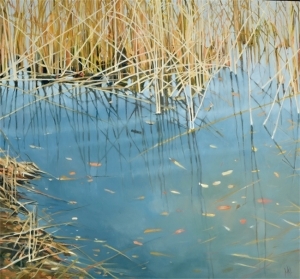 She paints the river. And as those of us who live near water understand, there is always a new experience to be mined. The rivers of the Eastern Shore are the true treasures of the Chesapeake Bay and Marcy is their fierce advocate. Like so many who have made the protection of our unique and fragile environment their passion, she is once again facing the Sisyphean task of keeping these issues on the front burner. 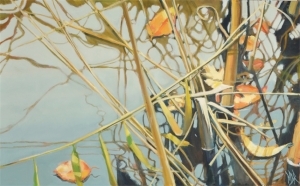 The choice of the title for her exhibition – Tangles & Knots – hints at this struggle. Having witnessed the successes and healing taking place in our rivers, to see it put at risk is daunting. For Ramsey the experience can be likened to a tangled ball of yarn, creating knots in our bodies and minds, and creating blocks in energy flow. Artists serve as our guides in difficult times even though the work they produce may be highly personal. The artist by connecting to what is most inspiring to them is often able to strengthen their inner resources through the creative process. Their journey offers a path from the personal to the universal and in the process may untangle knots for all of us. With this new body of work, Ramsey’s search for resolution to these tangled webs can be found by returning once again to her muse with a new invigorated energy. 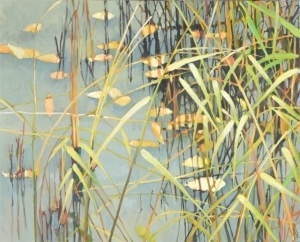 Although her large-scale oil paintings are at once almost pure abstraction, one feels the wind, smells the richness of the marsh and senses the physicality of the river. 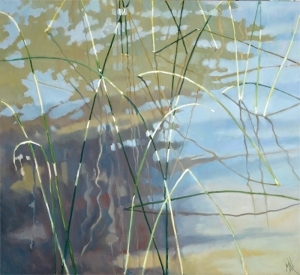 The viewer is invited into a world of sky, water, and sea grass but when you take up residency in Ramsey’s paintings you will become one with the river in all its intricacies. Her masterful paintings demand a response. Ramsey’s friend and neighbor, poet Meredith Davies Hadaway, captures this in words. 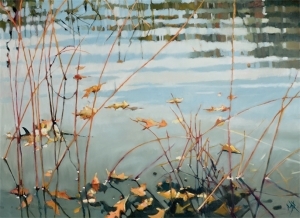 In an excerpt from her poem, Why the River, she echoes this symbiosis.